USES: This medication is used to treat various types of depression and related anxiety. It may help improve mood and feelings of well-being. This medication belongs to a class of medications called tetracyclic antidepressants. It works by affecting the balance of certain natural chemicals (neurotransmitters) in the brain. HOW TO USE: Read the Medication Guide provided by your pharmacist before you start taking maprotiline and each time you get a refill. If you have any questions, consult your doctor or pharmacist. Take this medication by mouth, usually 1 to 3 times daily or as directed by your doctor. If you take it only once a day, take it at bedtime to reduce daytime sleepiness. The dosage is based on your medical condition and response to treatment. To reduce your risk of side effects (such as drowsiness, dry mouth, dizziness), your doctor may direct you to start this medication at a low dose and gradually increase your dose. Follow your doctor's instructions carefully. Take this medication regularly in order to get the most benefit from it. To help you remember, take it at the same time(s) each day. Do not increase your dose or use this drug more often or for longer than prescribed. Your condition will not improve any faster, and your risk of side effects will increase. It is important to continue taking this medication even if you feel well. Do not stop taking this medication without consulting your doctor. Some conditions may become worse when this drug is suddenly stopped. Also, you may experience symptoms such as mood swings, headache, and tiredness. To prevent these symptoms while you are stopping treatment with this drug, your doctor may reduce your dose gradually. Consult your doctor or pharmacist for more details. Report any new or worsening symptoms immediately. This medication may not work right away. You may see some benefit within a week. However, it may take up to 3 weeks before you feel the full effect. Tell your doctor if your condition persists or worsens (such as your feelings of sadness get worse, or you have thoughts of suicide). PRECAUTIONS: See also Warning section. Before taking maprotiline, tell your doctor or pharmacist if you are allergic to it; or to tricyclic antidepressants (such as nortriptyline); or if you have any other allergies. This product may contain inactive ingredients, which can cause allergic reactions or other problems. Talk to your pharmacist for more details. Before using this medication, tell your doctor or pharmacist your medical history, especially of: bleeding problems, breathing problems, kidney problems, liver problems, recent heart attack, problems urinating (such as due to enlarged prostate), overactive thyroid (hyperthyroidism), a certain eye problem (glaucoma), personal or family history of mental/mood conditions (such as bipolar disorder, psychosis), family history of suicide, seizures, conditions that may increase your risk of seizures (such as other brain disease, alcohol/sedative withdrawal). Maprotiline may cause a condition that affects the heart rhythm (QT prolongation). QT prolongation can infrequently result in serious (rarely fatal) fast/irregular heartbeat and other symptoms (such as severe dizziness, fainting) that require immediate medical attention. The risk of QT prolongation may be increased if you have certain medical conditions or are taking other drugs that may affect the heart rhythm (see also Drug Interactions section). 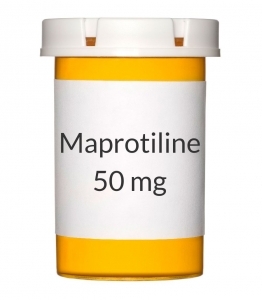 Before using maprotiline, tell your doctor or pharmacist if you have any of the following conditions: certain heart problems (heart failure, slow heartbeat, QT prolongation in the EKG), family history of certain heart problems (QT prolongation in the EKG, sudden cardiac death). Low levels of potassium or magnesium in the blood may also increase your risk of QT prolongation. This risk may increase if you use certain drugs (such as diuretics/"water pills") or if you have conditions such as severe sweating, diarrhea, or vomiting. Talk to your doctor about using maprotiline safely. This drug may make you drowsy or dizzy or cause blurred vision. Do not drive, use machinery, or do any activity that requires alertness or clear vision until you are sure you can perform such activities safely. Limit alcoholic beverages. Before having surgery, tell your doctor or dentist about all the products you use (including prescription drugs, nonprescription drugs, and herbal products). This medication may make you more sensitive to the sun. Avoid prolonged sun exposure, tanning booths, and sunlamps. Use a sunscreen and wear protective clothing when outdoors. If you have diabetes, this drug may make it harder to control your blood sugar levels. Monitor your blood sugar levels regularly and tell your doctor of the results. Your doctor may need to adjust your diabetes medication, exercise program, or diet. Caution is advised when using this drug in older adults because they may be more sensitive to its side effects, especially dry mouth, dizziness, drowsiness, confusion, and difficulty urinating. During pregnancy, this medication should be used only when clearly needed. Since untreated depression can be a serious condition, do not stop using this medication unless directed by your doctor. If you are planning pregnancy, become pregnant, or think you may be pregnant, immediately discuss with your doctor the benefits and risks of using this medication during pregnancy. This medication passes into breast milk and the effect on a nursing infant is unknown. Consult your doctor before breast-feeding. DRUG INTERACTIONS: Drug interactions may change how your medications work or increase your risk for serious side effects. This document does not contain all possible drug interactions. Keep a list of all the products you use (including prescription/nonprescription drugs and herbal products) and share it with your doctor and pharmacist. Do not start, stop, or change the dosage of any medicines without your doctor's approval. Some products that may interact with this drug include: arbutamine, levodopa, sibutramine, bronchodilators/decongestants (such as albuterol, epinephrine, phenylephrine), stimulants (such as amphetamines, methylphenidate, streets drugs including MDMA/"ecstasy"), thyroid supplements, anticholinergic drugs (such as benztropine, belladonna alkaloids), central-acting drugs to treat high blood pressure (such as clonidine, guanabenz, guanadrel, methyldopa, reserpine). Avoid taking MAO inhibitors (isocarboxazid, linezolid, methylene blue, moclobemide, phenelzine, procarbazine, rasagiline, selegiline, tranylcypromine) within 2 weeks before, during, and after treatment with this medication. In some cases a serious (possibly fatal) drug interaction may occur. Other medications can affect the removal of maprotiline from your body, thereby affecting how maprotiline works. These drugs include cimetidine, fluconazole, terbinafine, drugs to treat irregular heart rate (such as quinidine/propafenone/flecainide), antidepressants (such as SSRIs including paroxetine/fluoxetine/fluvoxamine). This is not a complete list. Many drugs besides maprotiline may affect the heart rhythm (QT prolongation in the EKG), including amiodarone, cisapride, dofetilide, pimozide, procainamide, quinidine, sotalol, macrolide antibiotics (such as erythromycin), among others. Therefore, before using maprotiline, report all medications you are currently using to your doctor or pharmacist. Tell your doctor or pharmacist if you are taking other products that cause drowsiness, including alcohol, antihistamines (such as cetirizine, diphenhydramine), drugs for sleep or anxiety (such as alprazolam, diazepam, zolpidem), muscle relaxants, and narcotic pain relievers (such as codeine). Check the labels on all your medicines (such as allergy or cough-and-cold products) because they may contain decongestants or ingredients that cause drowsiness. Ask your pharmacist about using those products safely. Also report the use of drugs which might increase seizure risk when combined with maprotiline, including bupropion, isoniazid (INH), phenothiazines (such as thioridazine), theophylline, or tricyclic antidepressants (such as nortriptyline), among others. Consult your doctor or pharmacist for details.